Home Entertainment Celebrity News Diamond first African artiste to ever go Platinum! Tanzanian bongo star is finally living up to his name Diamond Platnumz. The heartthrob has made history by becoming the first African artiste to get six time platinum sales for his single ‘Marry You’ featuring Ne-yo. With over 17 million views on YouTube, the song that dropped eight months ago has left Diamond making serious bank an earning him international recognition. He took to the gram to express his joy! 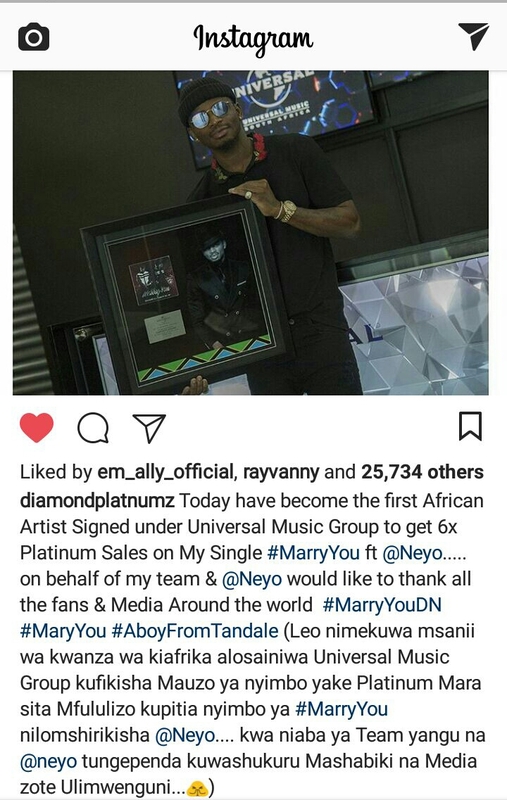 ‘’Today have become the first African Artist Signed under Universal Music Group to get 6x Platinum Sales on My Single #MarryYou ft @Neyo….. on behalf of my team & @Neyo would like to thank all the fans & Media Around the world#MarryYouDN #MaryYou#AboyFromTandale (Leo nimekuwa msanii wa kwanza wa kiafrika alosainiwa Universal Music Group kufikisha Mauzo ya nyimbo yake Platinum Mara sita Mfululizo kupitia nyimbo ya #MarryYou nilomshirikisha @Neyo…. kwa niaba ya Team yangu na @neyo tungependa kuwashukuru Mashabiki na Media zote Ulimwenguni…) #ABoyFromTandale,’’ he posted. Congratulations Diamond, keep taking East African music to great heights. Previous articleCardi B and Offset are engaged! 5 Ways To Stand Out From The Crowd.